With the aide of LSK121 Dental Lab, Davis Dental Center is planning all our implant cases. This is the most accurate way to plan single tooth and full mouth implant cases. Watch these videos, they are absolutely amazing! 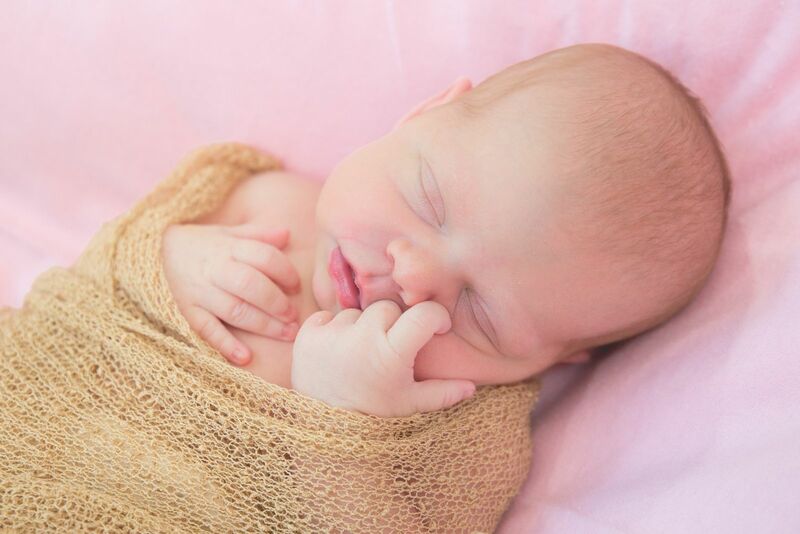 Dr. Rachel and Chris Stockton welcomed their second daughter Sydney Rose Stockton on Saturday August 6, 2016. Dr. Rachel saw her last patient the Friday before and delivered Sydney early Saturday morning at 7lb and 4oz. Both mom and baby did well and forever changed the dynamics of the Davis-Stockton family. Older sister Lydia was excited to meet her new sister and promises to help out when she can. Every year the Louisville Dental Society host a Day at the Races for the Louisville Dental Community. On June 3, 2016 Davis Dental Center brought most of their staff to an exciting day at Churchill Downs to mingle with other local dental practices, eat, drink and bet on the horses. A fun day was had by all! In April 2016, Davis Dental Center added another new piece of technology to our office, a 3D Cone Beam CT scanner. 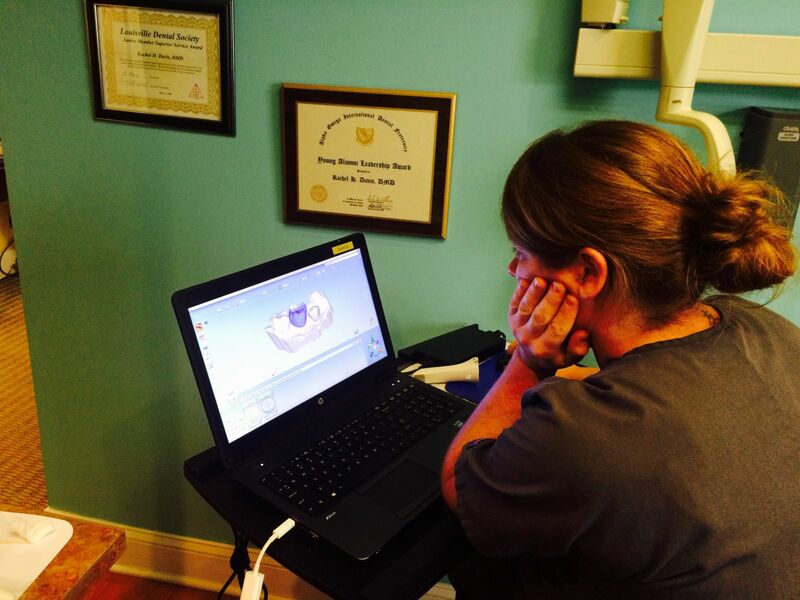 In less than 15 seconds, one of our trained staff members can perform a low dose scan of our patients upper and lower jaws in 3D. This piece of technology can help the doctors diagnose dental problems more accurately and pre-plan implant surgeries with ease. We are now offering implant guided surgery with stents. 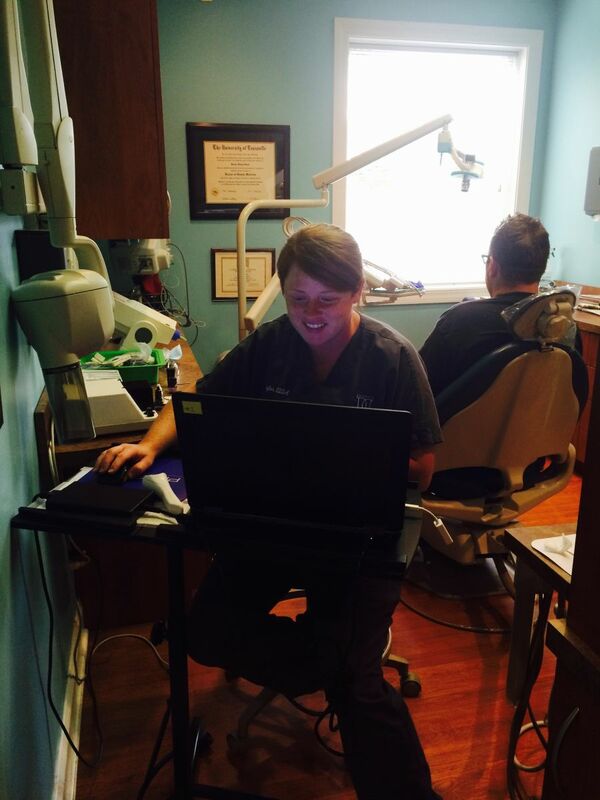 In November 2015, Dr. Rachel became certified in Implant Guided Surgery through Hiossen Implant Company. This specialized procedure takes all the guess work out of implant planning and placement. A CT scan is acquired along with an impression. All the implant planning is done before the patient's surgery date. The appropriate implant sized is selected from the CT scan and sent to lab to construct a surgical stent from the CT scan and impression. This stent is then placed in the mouth during the implant placement and reduces the amount of surgery needed. Whereas before the tissue had to be flapped back, now just a small hole of tissue is removed and the stent guides the surgeon to place the pre-planned exact implant into the bone. Traditional surgeries that used to take hours are now reduced to minutes. Dr. Rachel traveled to Chicago to learn this new technique. Within 30 minutes she had extracted one tooth and placed five implants on the lower. See the before and after x-rays below. In 2014, Davis Dental Center became one of the only offices in the surrounding Louisville are to offer SAME DAY CROWNS AND RESTORATIONS. 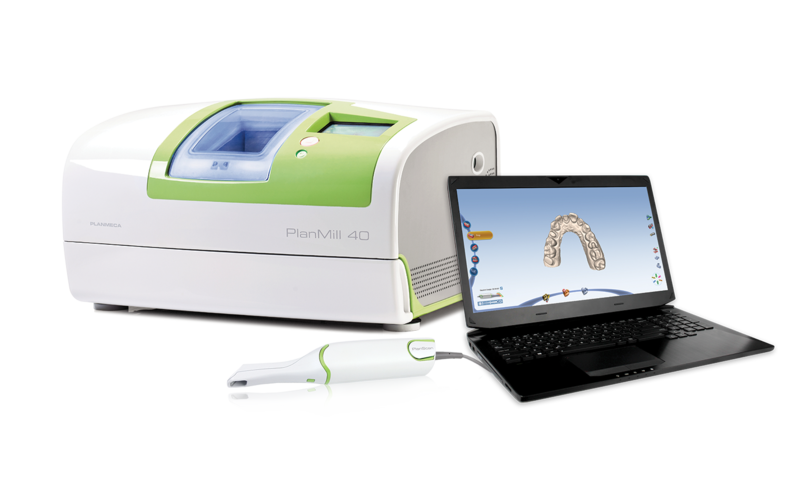 With the help of E4D Planmeca CAD/CAM (computer assisted design/computer assisted milling) technology has arrived at Davis Dental. No more impressions or waiting a month to have your crown completed at the lab. The appointments are usually 2-3 hours in length with a break in the middle to design, mill and fire the restorations. It is a great service that we can now offer to our patients. Below are two photos of a crown design in action by our outstanding assistant Taylor.